Planetary Mixers (also called Vertical Mixers) are named after the orbital motion of the attachment, whether it be whip, paddle or dough hook. The mixing implement travels in circular orbits along the inside wall surfaces of the mixing bowl while the mixing bowl stays in place. Planetary Mixers are useful to any business which requires versatility from their mixer or will only need to mix dough in smaller batches. The broad range of attachments makes the planetary mixer highly versatile. It can mix, blend, whip and stir all types of mixtures whereas Spiral Mixers can only mix dough. 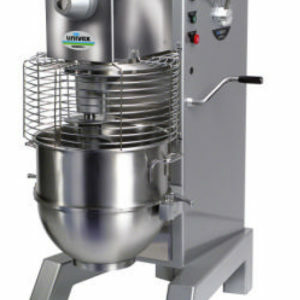 However, unless bread is the only product being produced by a bakery, the planetary mixer is invaluable mixing equipment in most bakeries. TMB Baking works both Univex and VMI to supply quality planetary mixers to our customers.